Fifteen DNCBer’s enjoyed a gorgeous, sunny Monday morning on an “away trip” to Blaine, Washington. We were: Roger, Mike, PB Lorna, Sheila, Jane Z, Annie K & Eileen, Anne M, Ken & Anne A, Marion, White Rock Al, Deborah, Kay and Tom. Hi-lites were many, some in breeding plumage; read on as I elaborate. 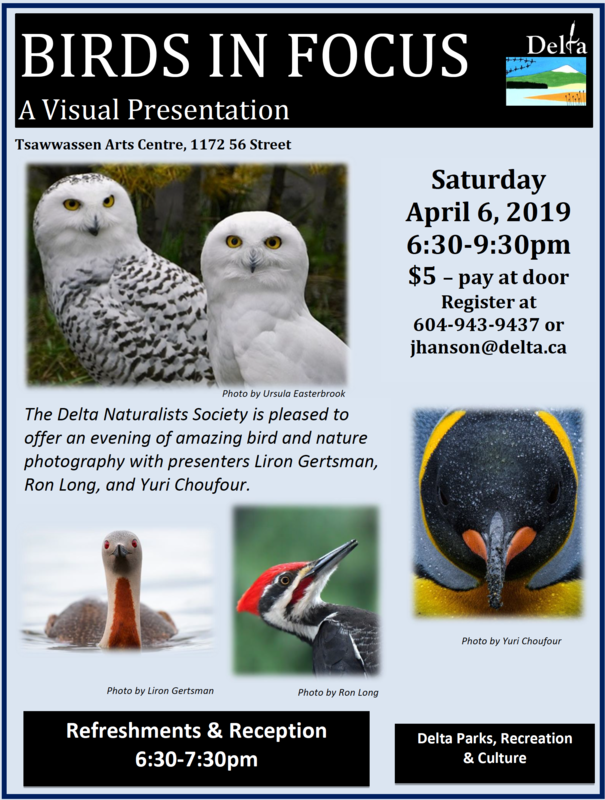 Check out Marion’s, Ken’s and Roger’s photos on our DNCB Blog and our DNCB Picasa site. Two carloads left Petra’s at 8:00 a.m. to meet the others at (or near?) the Peace Arch Park parking lot behind the duty-free shop. We passed several flocks of Trumpeter Swans feeding in the fields along highway 99. Five vehicles had no border issues and we all met at the Drayton Harbour Marina at the scheduled 9:00 a.m. 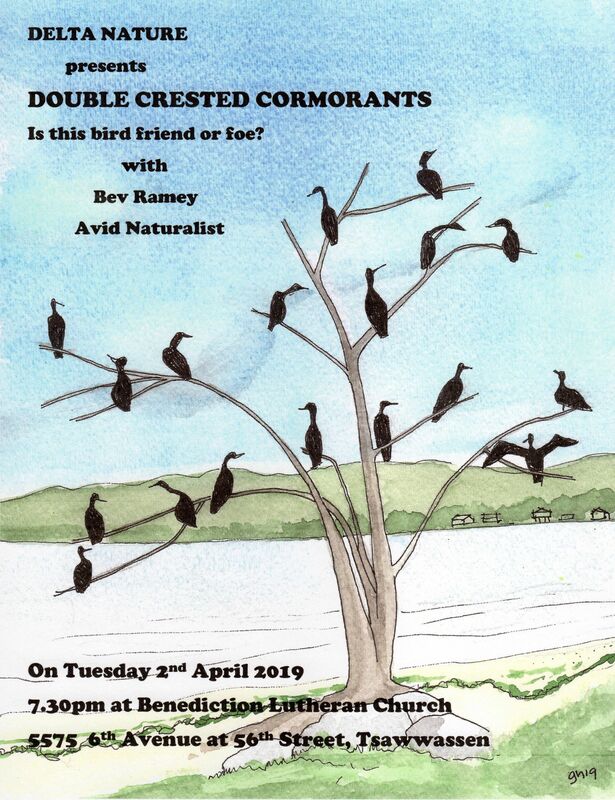 I mention this because it’s not uncommon that Birder’s Plans unravel for various reasons. There was a nice pair of Belted Kingfishers at the beginning of the Marina Road, with a lonely Yellowlegs feeding in the mud. We spent an hour or so at the lookout, interrupting a sun-bathing dog walker. Common Loons, in various breeding plumages, were close by while many Pacific and an occasional Red-throated were further out. Lots of Grebes too and we had interesting discussions identifying the Horned, Red-necked and five Western (no Eared spotted). 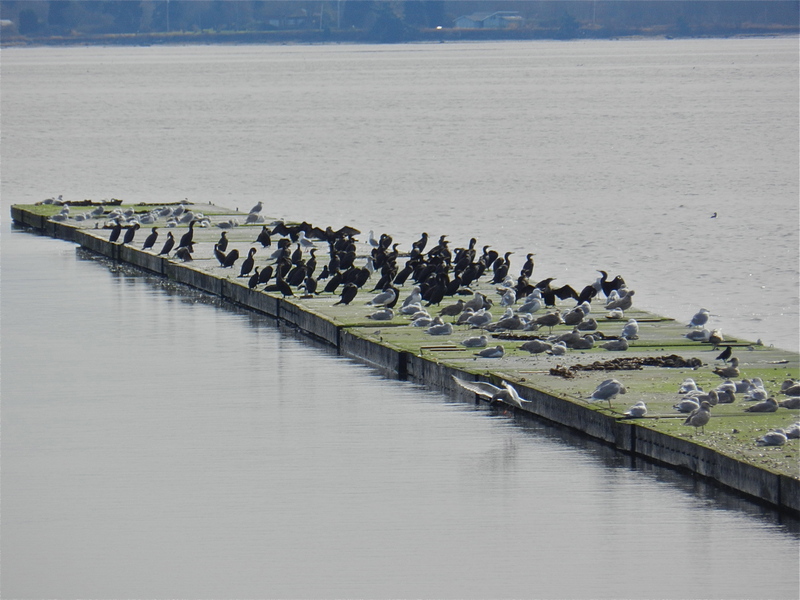 Both Pelagic and Double-crested Cormorants were on the breakwall. 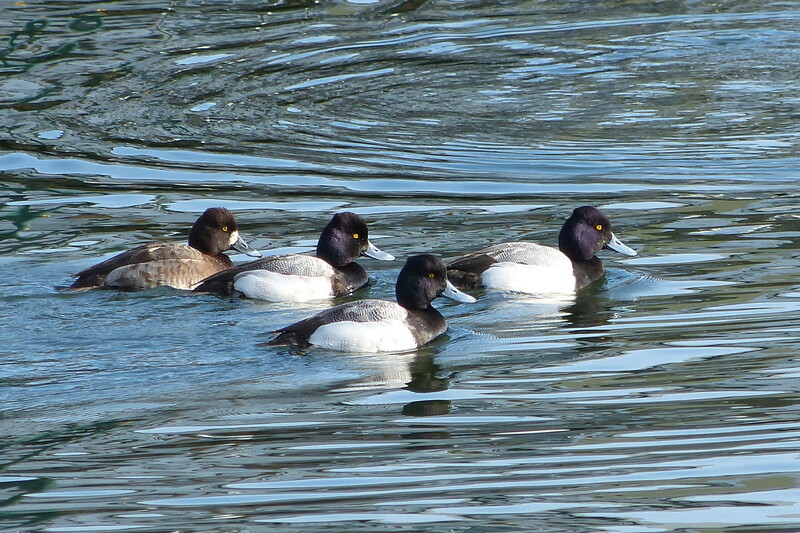 Scaup too, I think both Lesser and Greater. Only Common Goldeneye were here, but we saw several Barrow’s later on the other side of the bay. Flashy Red-breasted Mergansers were quite common everywhere. 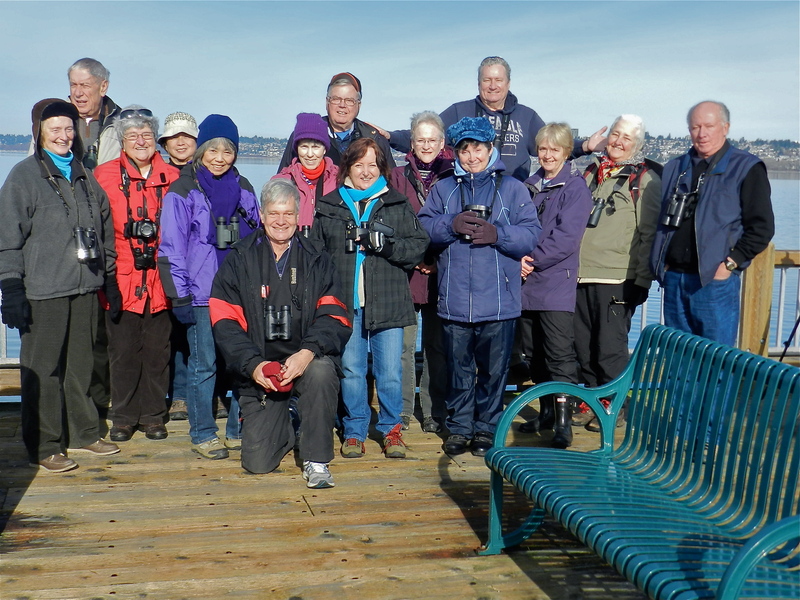 Ken took the mandatory Group Photo in the brilliant sun with White Rock in the background across the bay. 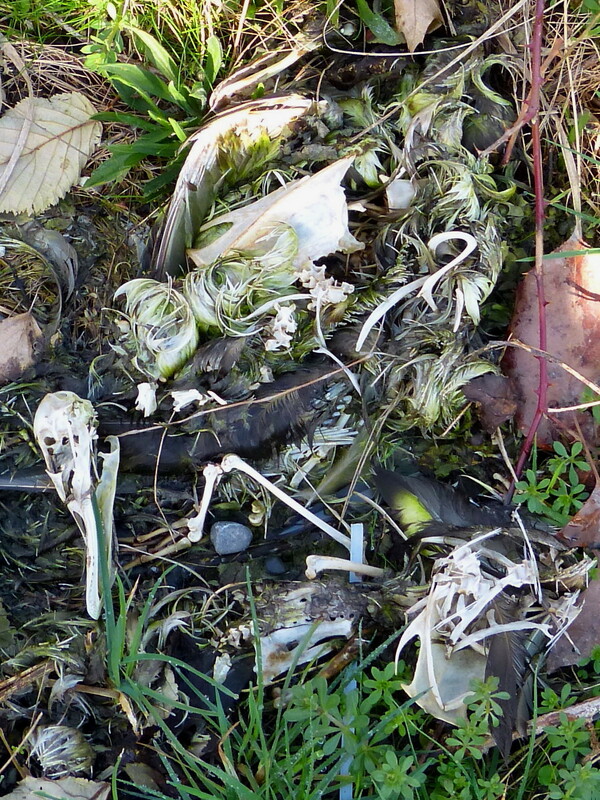 We started our drive back through Blaine and around the Drayton Bay at 10:00 a.m., stopping for cheap gas, then for Annie K to collect the remains of a bird for Terry’s Nats Display. A singing Dark-eyed Junco really captured the essence of Spring for us. Bufflehead, Northern Pintail, American Wigeon and Green-winged Teal were close to shore at this stop, with another Yellowlegs resting on shore. 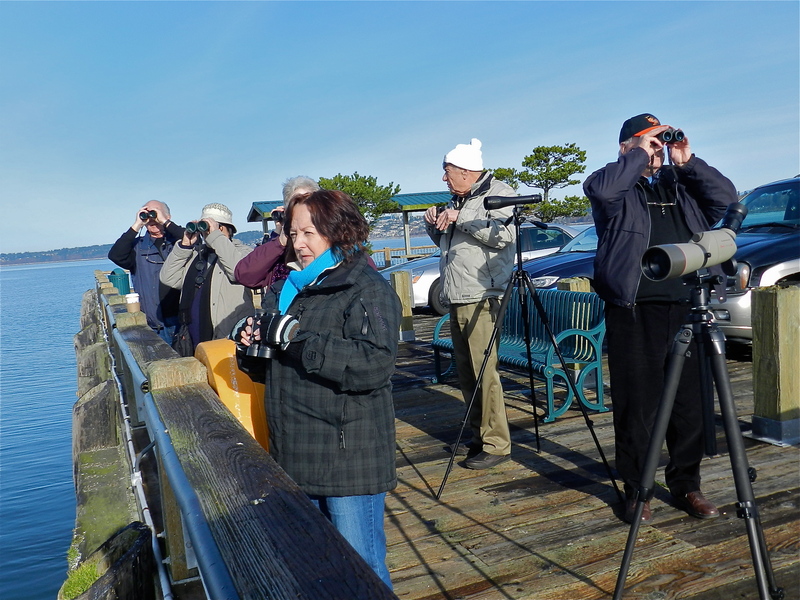 We moved on toward Semiahmoo Park and stopped to see some Scoters, lots of Surf and White-winged, but no one could find a Black Scoter. 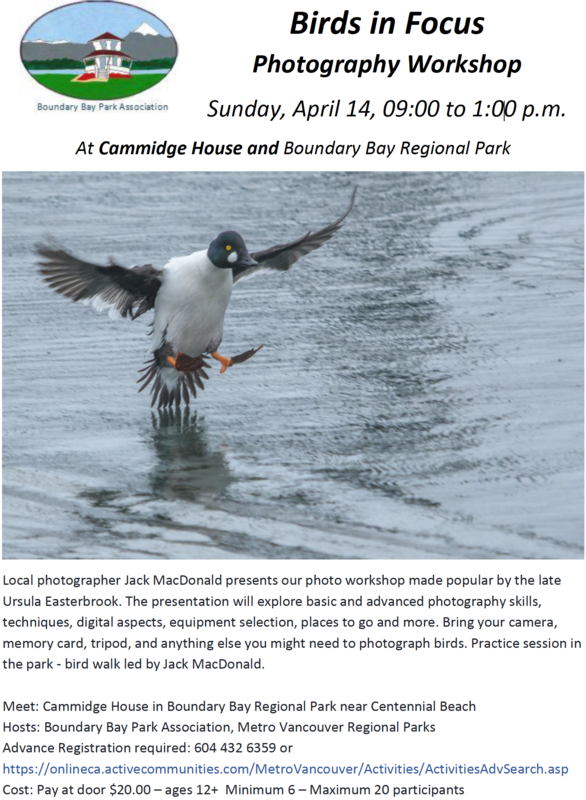 Nor did we see Canvasbacks or Ruddy Ducks which are normally there (and likely still are). 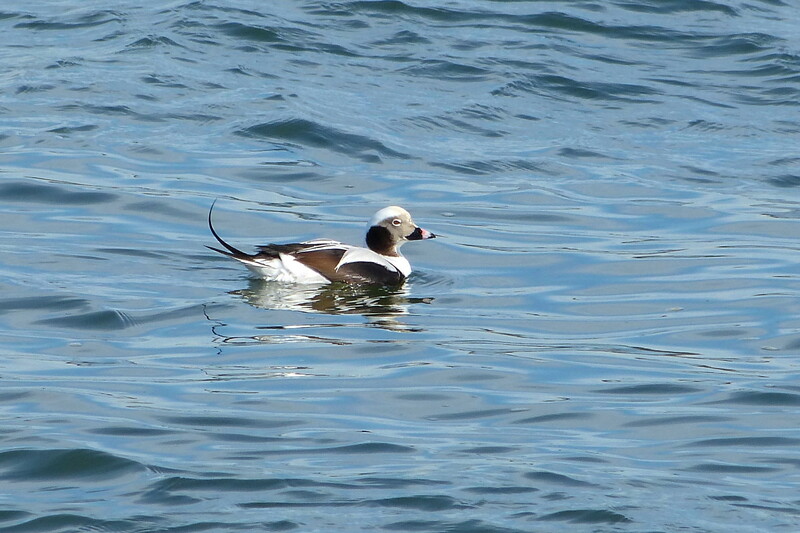 We saw Brant in this bay and outside in Boundary Bay. Further along near the Semiahmoo marina, there were Harlequin Ducks with the Scaup, and a nice flock of Sanderling moved from the jetty to the shore in front of us. 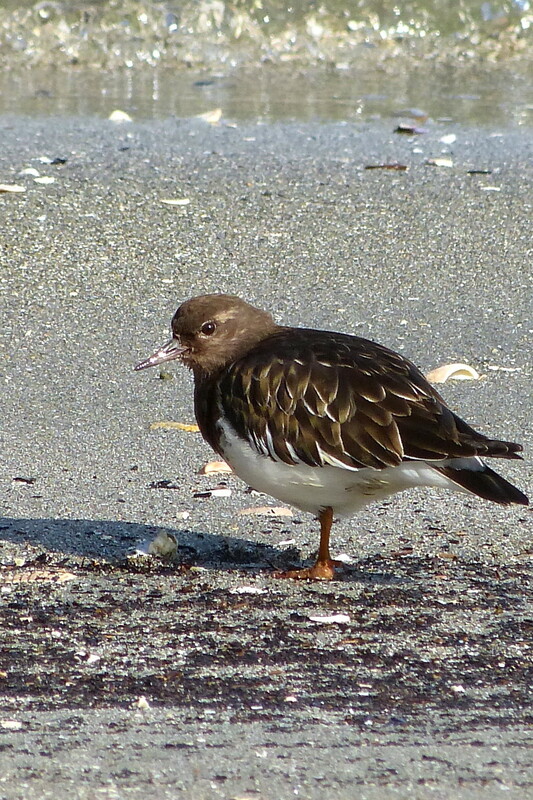 A couple of Black Turnstones were also disguised next to stones right in front of us. that we saw here last year was still in the same area. 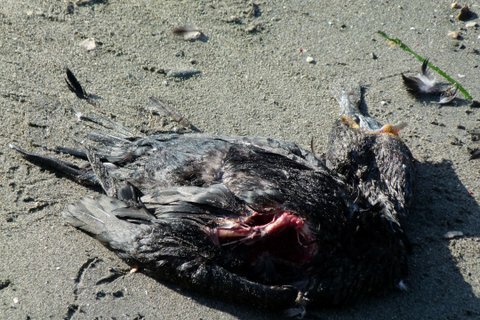 A dead Cormorant with a huge fish sticking out of its beak was a morbid sighting, obviously it choked to death. 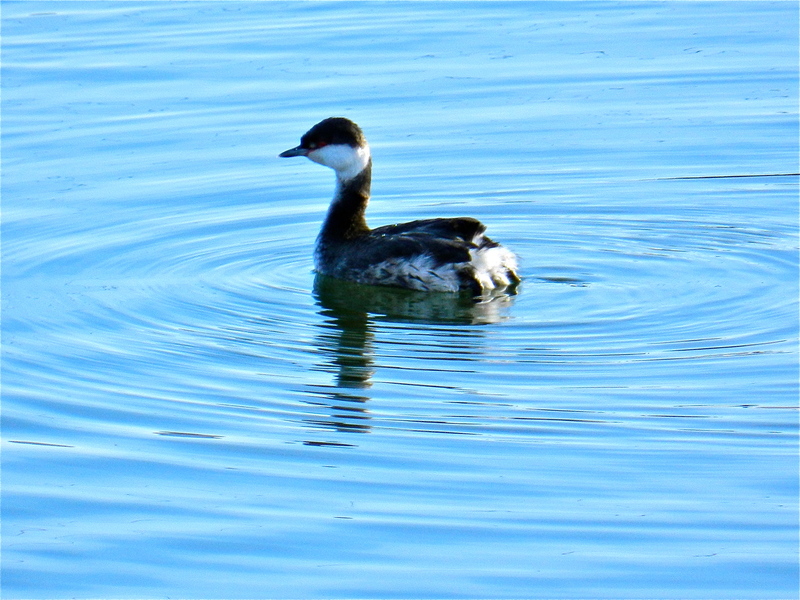 The Loons, Grebes and Mergansers were here, but we could not see any Alcids (Guillemots, Murres, Auklets). The resident Peregrine Falcon wasn’t around either. So we went back to the café where some bought a soup while others just sponged food. About a 15 minute line-up at the Border, but we got back to Petra’s about 1:30 p.m. An awesome morning, with some neat sightings and the usual inane conversations. Follow the 1200 km route of the Enbridge Pipeline. 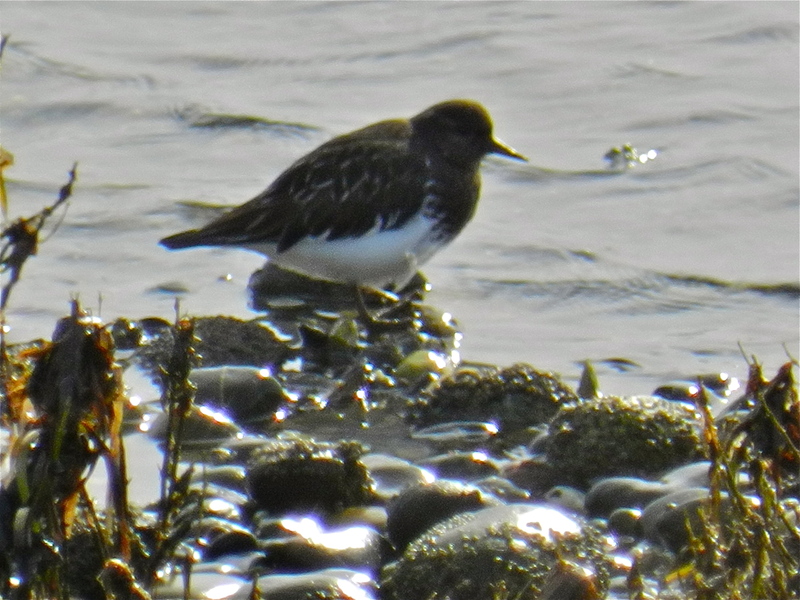 This entry was posted in *DNCB, Blaine Marine Park, Drayton Harbor, Semiahmoo Spit. Bookmark the permalink.